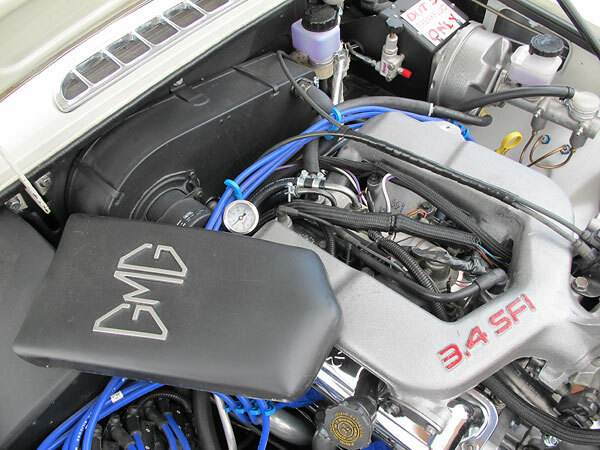 Engine: GM 3.4L 60-degree V6 engine with sequential fuel injection, from a 1995 Chevrolet Camaro. 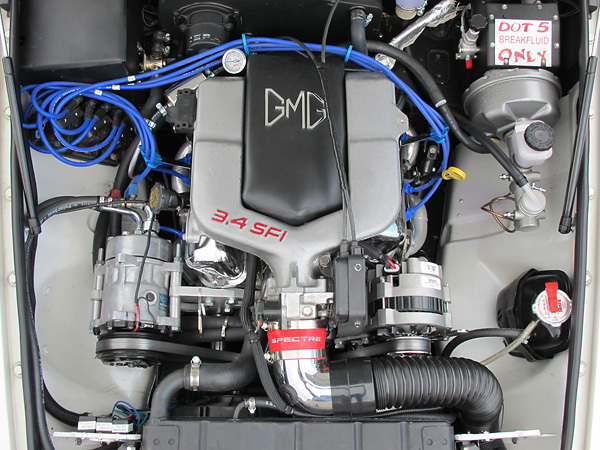 Machine work by Performance Race Engineering. Bored 0.060" over. Stock bearing sizes. Three angle valve job. ARP hardware throughout. Classic Conversions motor mounts. 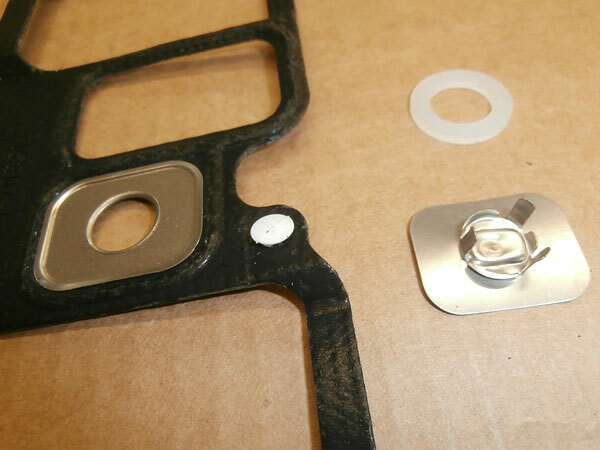 Classic Conversions accessory brackets and serpentine pulley kit. 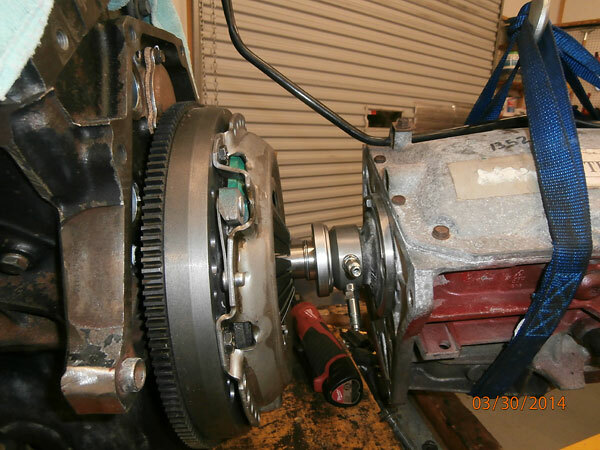 Ultima 81-1004 remanufactured alternator. Sanden air conditioning compressor. 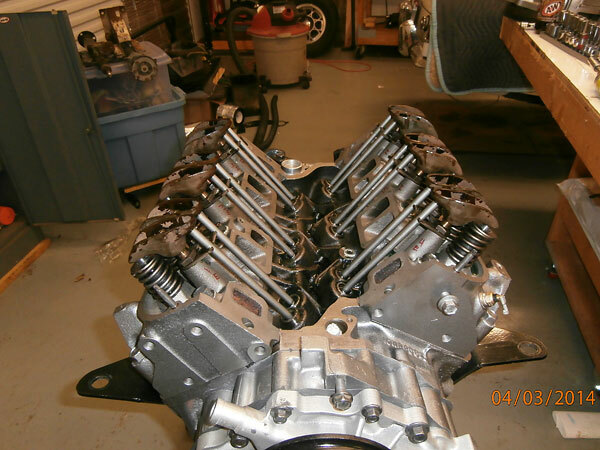 Edelbrock valve covers. 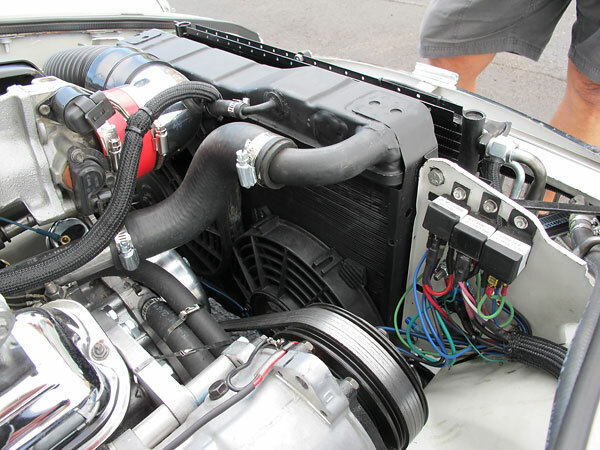 1995 Chevrolet Camaro ECM, reflashed with Tuner Cats cable and software. 1995 Chevrolet Camaro cruise control computer/actuator. 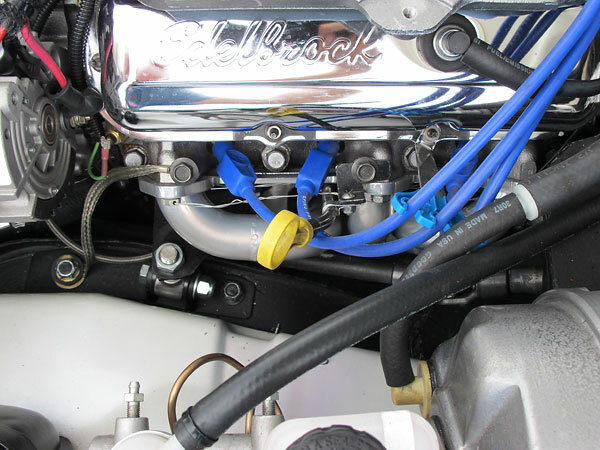 Taylor Spiro-Pro 8mm spark plug wires. Oiled gauze air filter. Motorcraft FL-1A oil filter, remote mounted. 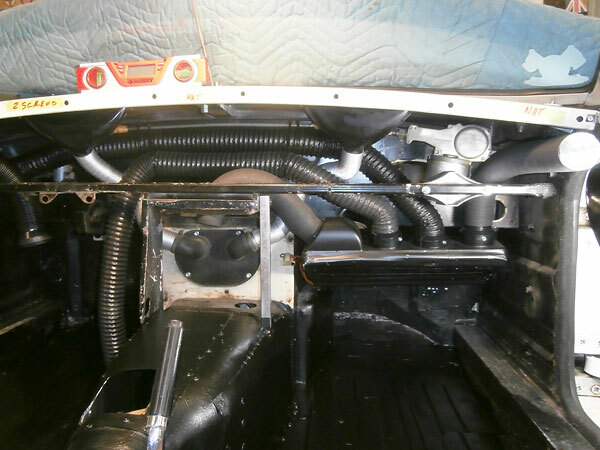 Cooling: late model MGB radiator, modified with short turn-up for bottom hose. Honda hose spacer. Two electric fans pulling, plus one electric fan for the AC condenser. 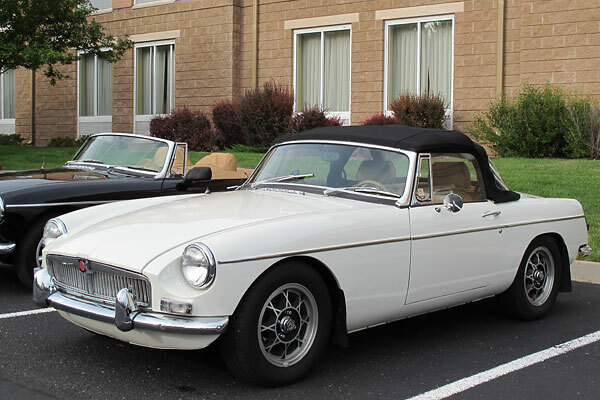 Late model MGB surge tank. 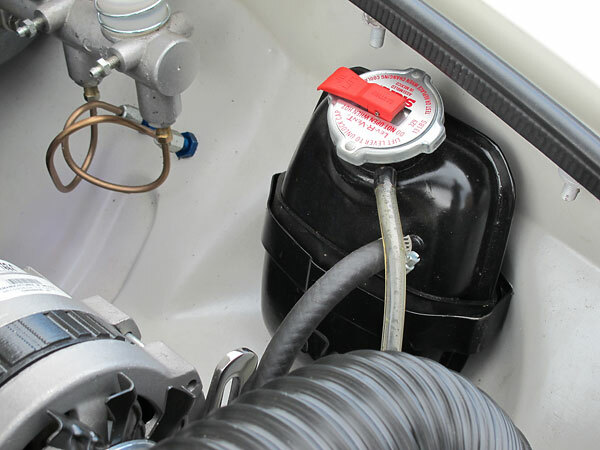 Stant 13psi radiator cap. 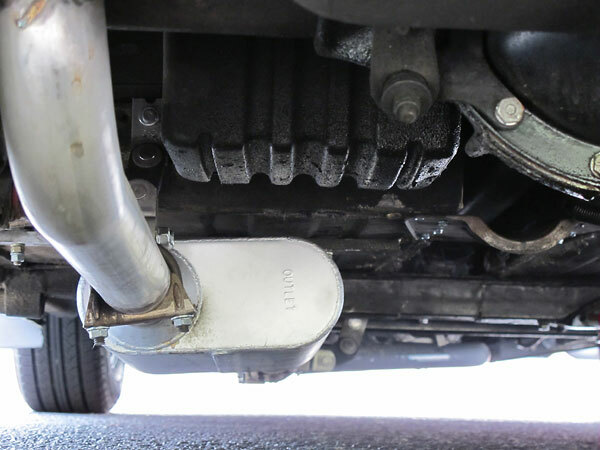 Exhaust: Classic Conversions headers, ceramic coated inside and out. Safety-wired header flange bolts. 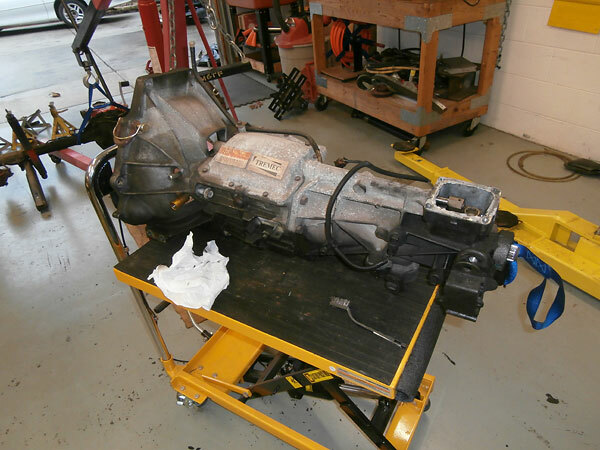 Transmission: Borg-Warner/TREMEC T5 5-speed (from 1998 Camaro). 0.72:1 fifth gear. 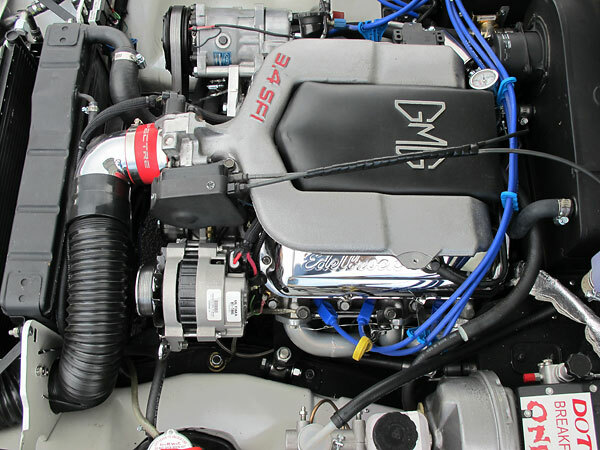 Chevrolet S10 bellhousing. Diaphragm pressure plate. BMC British Automobile hydraulic throwout bearing kit. 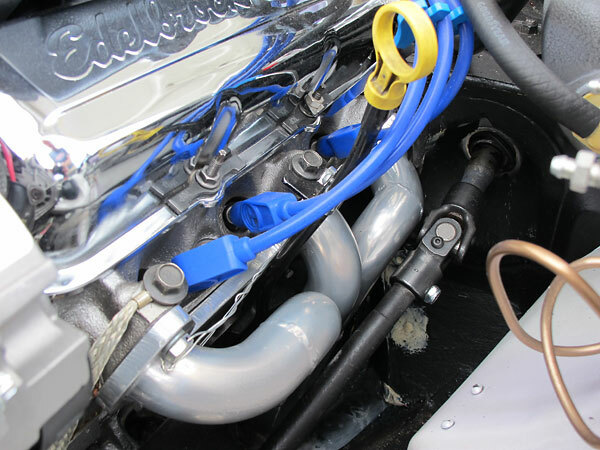 Wilwood master cylinder with modified Miata push rod. Front Susp. : stock, although updated with red polyurethane bushings. 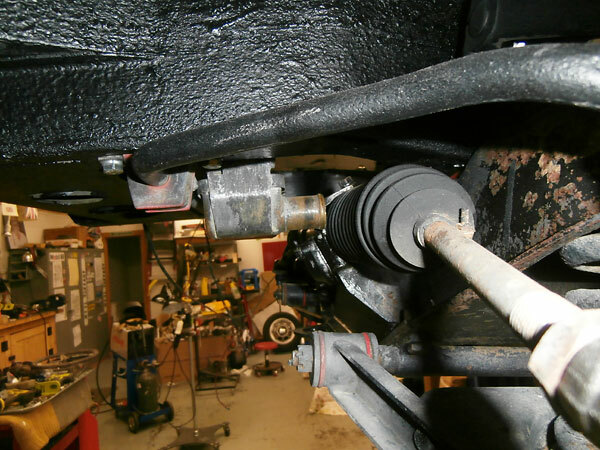 Borgeson steering universal joint. 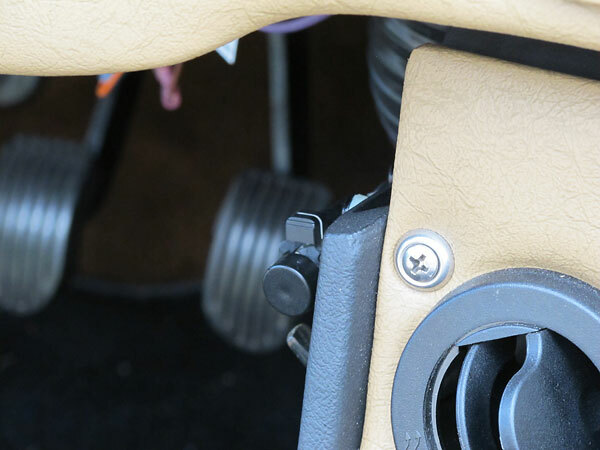 Brakes: later model MGB pedal assembly and power brake booster. Wilwood tandem master cylinder. DOT5 brake fluid. Summit bias valve, currently unconnected. 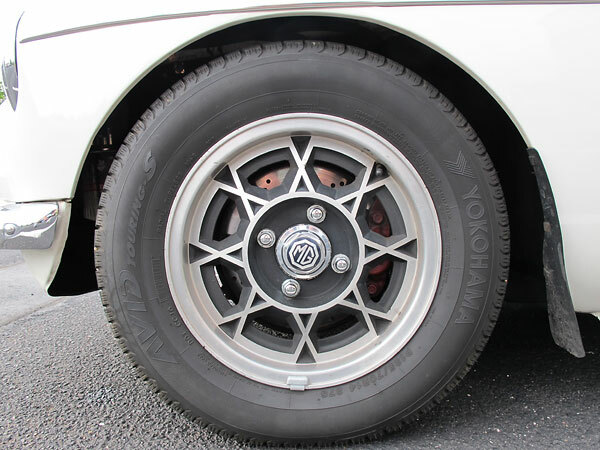 Wheels/Tires: Toyota Celica 14" aluminum wheels. (Not sure what year. They were laying in the wheel pile at my brother's salvage yard.) Yokohama Avid Touring S tires (P185/70R14). 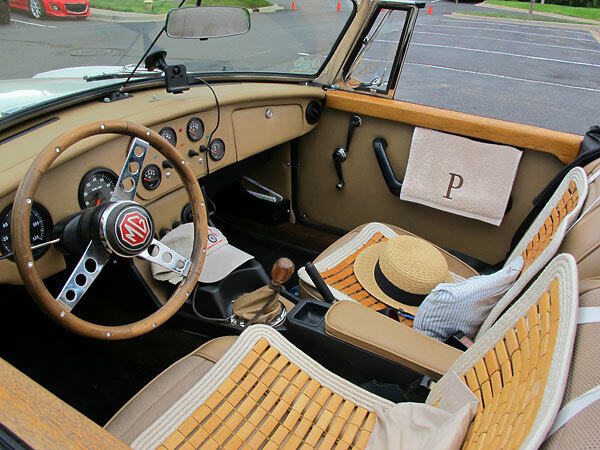 Interior: wood rimmed steering wheel. Custom dashboard and center console. Custom door cards and panels. Custom oak door caps. Mazda Miata armrests. New carpet. 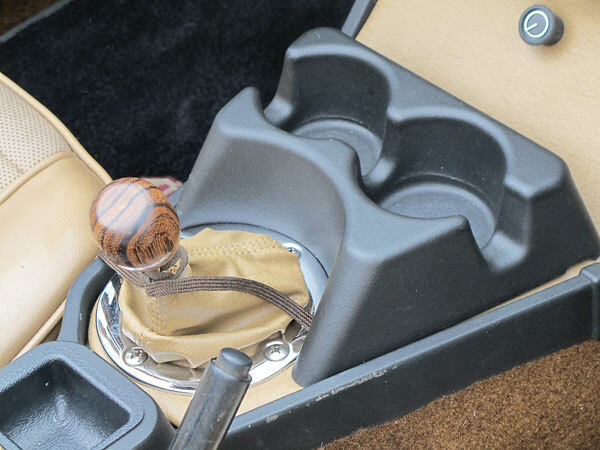 Zebrawood shifter knob? Two-cup cupholder. Body: stock. 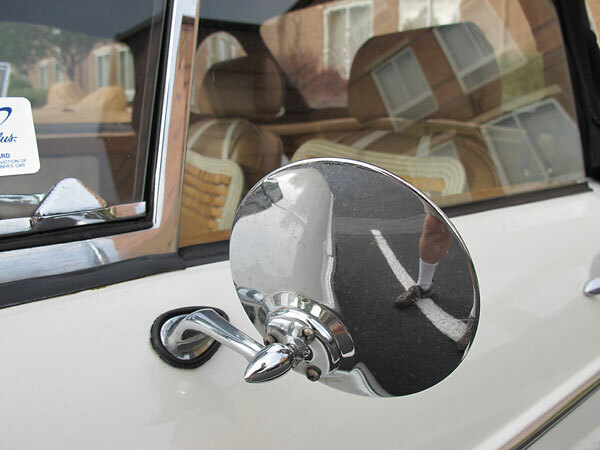 Sikkens "Diamond Pearl White" paint (see below). 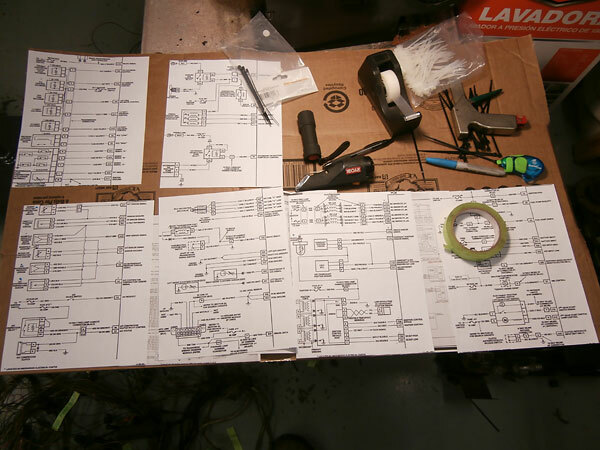 Electrical: custom wiring based on a Rebel Wiring kit, with four more fuses than stock. 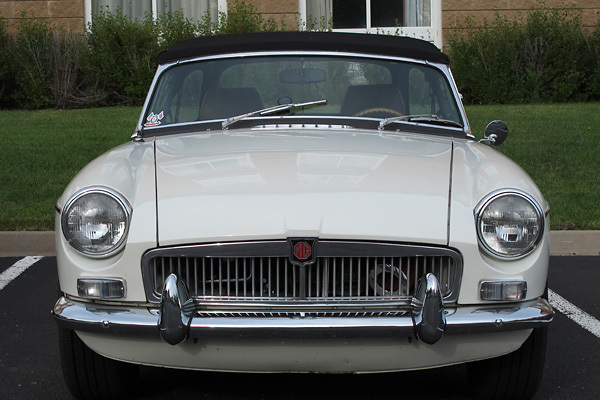 Comments: "When I started in September 2013, I only planned to rebuild the MGB engine and repaint the engine bay. 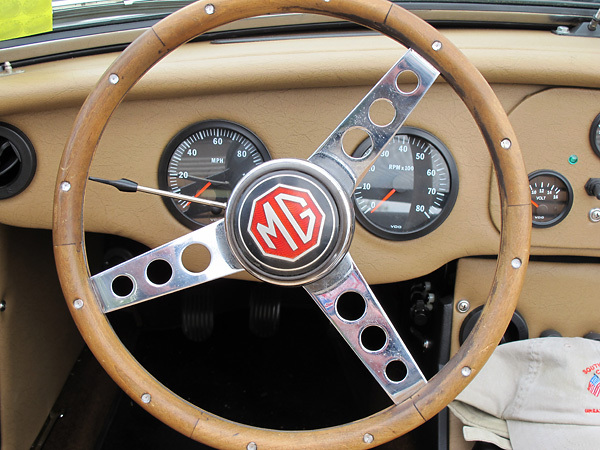 I opened three MGB engines only to find mayhem and destruction. 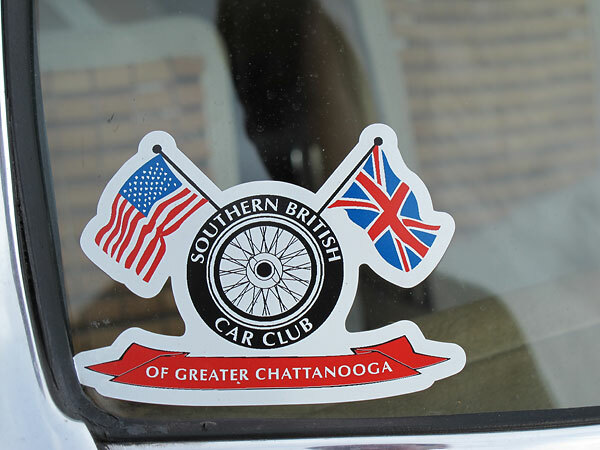 Then I went to miniV8 meet 2013 in Townsend Tennessee, because brother Jim Watson invited me. 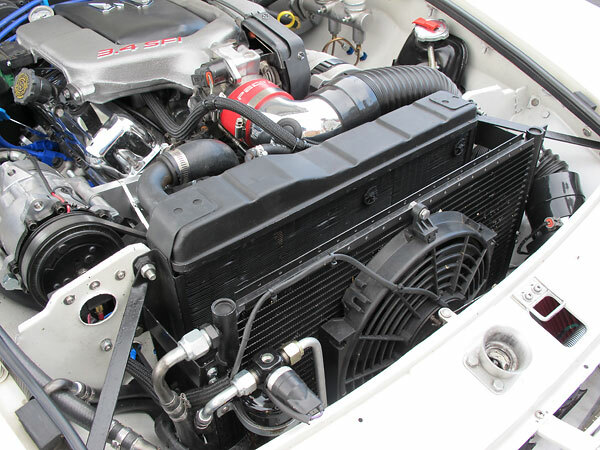 (We drove our VTEC powered Mini.) The rest is history. I completed the build in time to leave on our maiden voyage to French Lick, Indiana to attend NAMGBR's 2014 convention. We left with only only 34 miles on the speedometer. All went well. 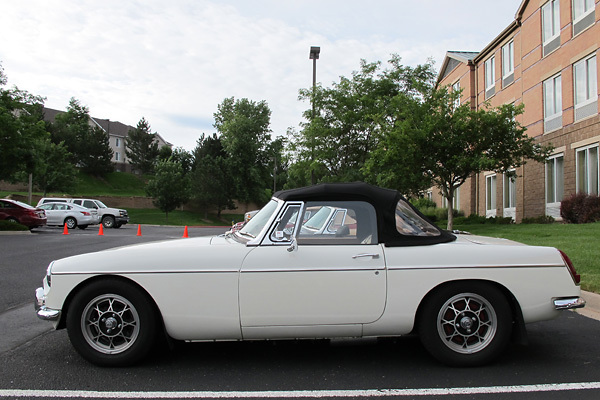 We drove to Colorado Springs for BritishV8 2014. We've now covered over 5000 miles." "Big upgrades are coming soon! I'm replacing the MGB rear end with a 1998 Camaro rear end, narrowed by Jeff at Hudlow Axle in Rossville, Georgia. 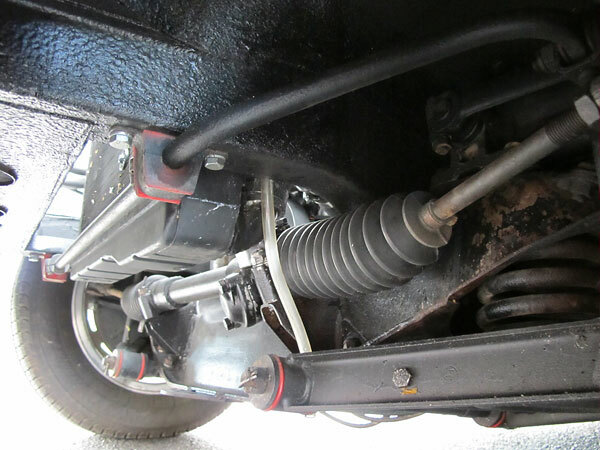 The Chevrolet 10-bolt axle has been set up with limited slip differential, 3.42:1 gear set, and disc brakes. 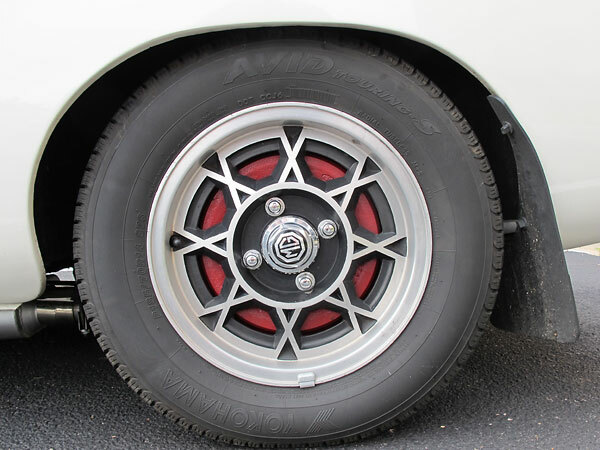 I'll upgrade to Bill Guzman's (Classic Conversions) 4-link rear suspension set-up and to new wheels and tires when I install the Chevrolet rear end." 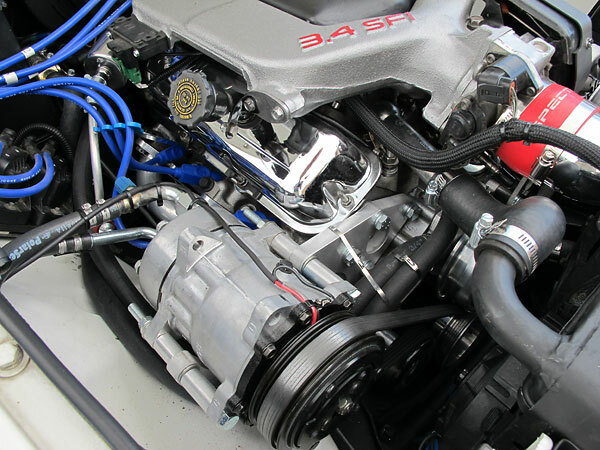 GM 3.4L 60-degree V6 engine with sequential fuel injection, from a 1995 Chevrolet Camaro. 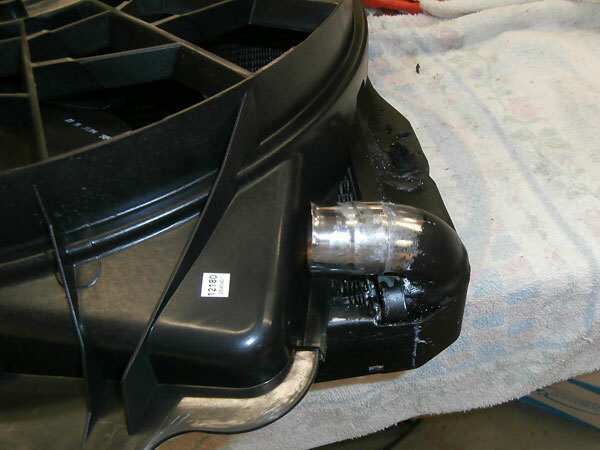 it a 'Hot Air Intake', so I moved it to in front of the radiator." 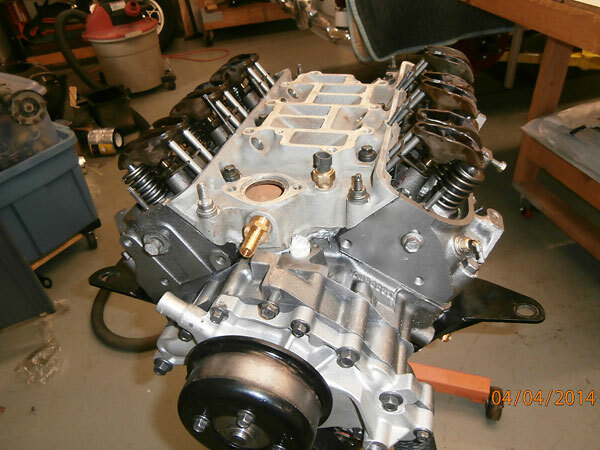 Charles fabricated this handsome cover for the fuel injector valley. 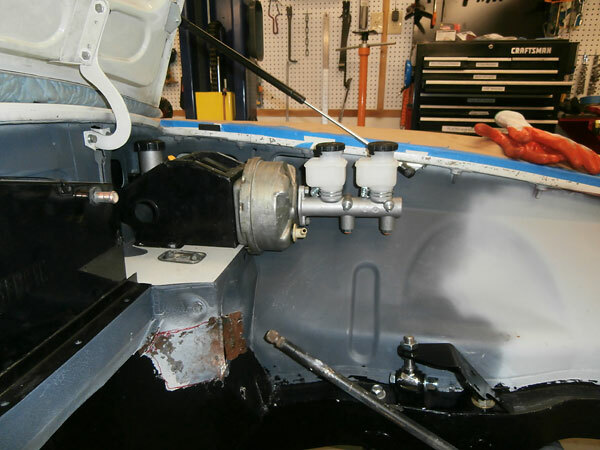 Later model MGB pedal assembly and power brake booster. Wilwood tandem master cylinder. friend who races dragsters, I'm using red silicone high-heat gasket cement. Already 5000 miles, and no leaks!" 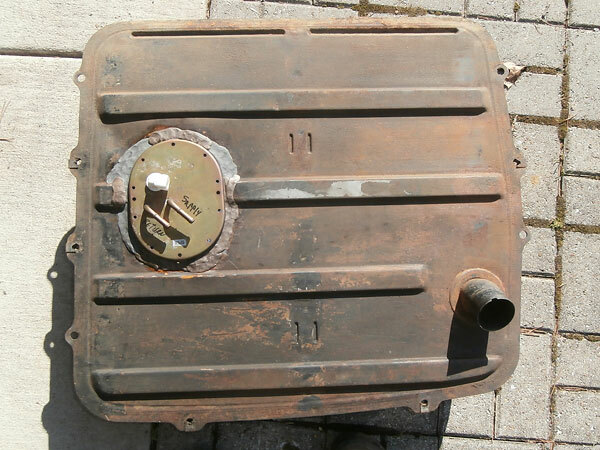 Late model MGB surge tank. Stant 13psi radiator cap. Remanufactured in Mexico. AR109062A 73 14046 I. 7340409495 02. 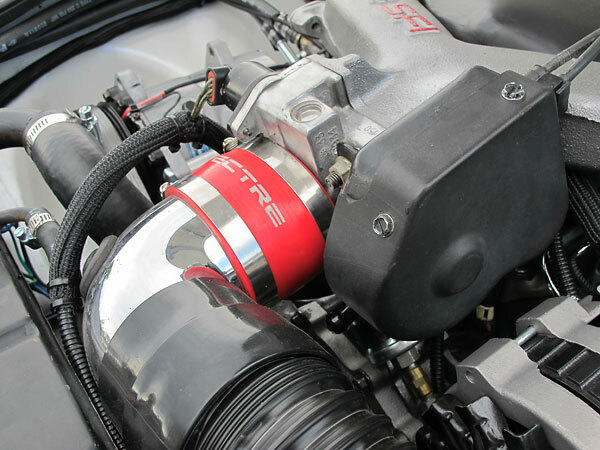 Spectre silicone hose. Ninety degree elbow. Rubber reducing coupler. 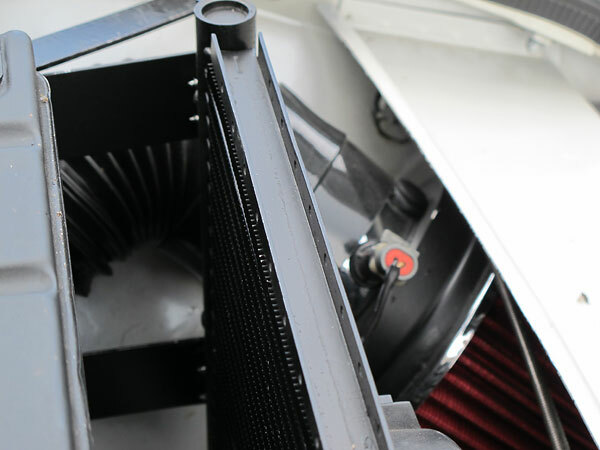 Air conditioning condenser and receiver drier. Intake air temperature sensor. Oiled gauze air filter. 1995 Chevrolet Camaro cruise control computer/actuator. Sanden air conditioning compressor on Classic Conversions Engineering bracket. Relays, left to right: ECM cooling fan, AC evaporator and condensor fan, ECM cooling fans override. 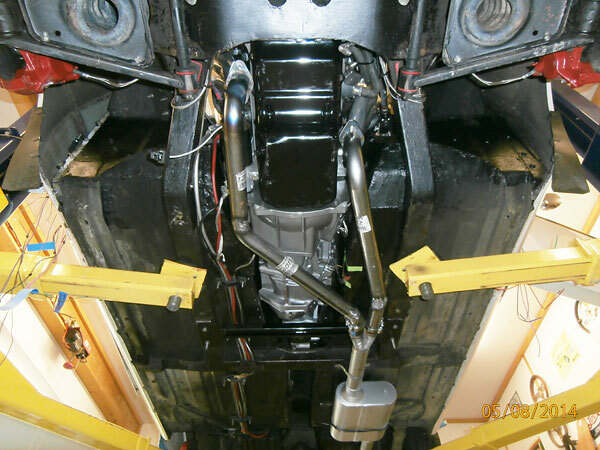 These Classic Conversions headers have been ceramic coated both inside and out. The header flange bolts gave all been safety-wired to prevent loosening. 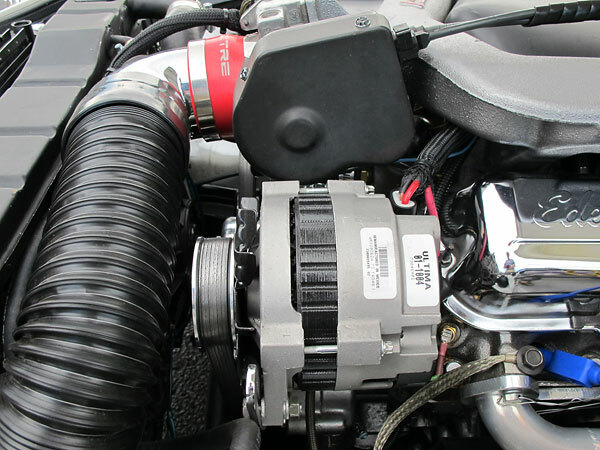 stock ignition coil packs and MAP sensor. Summit fuel pressure gage. mandrel bent steel tubing which he cut and welded as necessary. 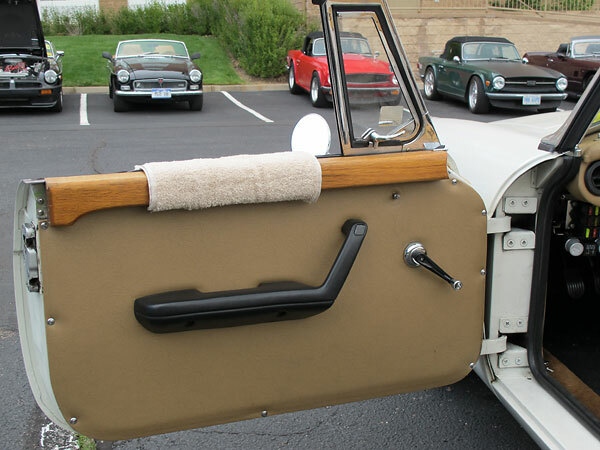 Later model MGB radiators, as shown here, are significantly taller than earlier ones. 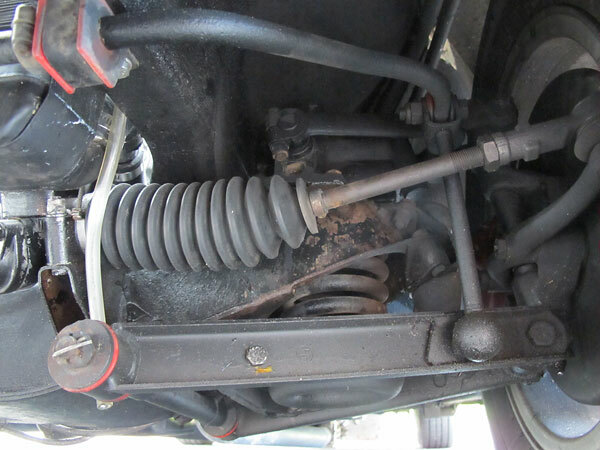 Stock MGB front suspension, although updated with red polyurethane bushings. Custom door cards and panels. Custom oak door caps. 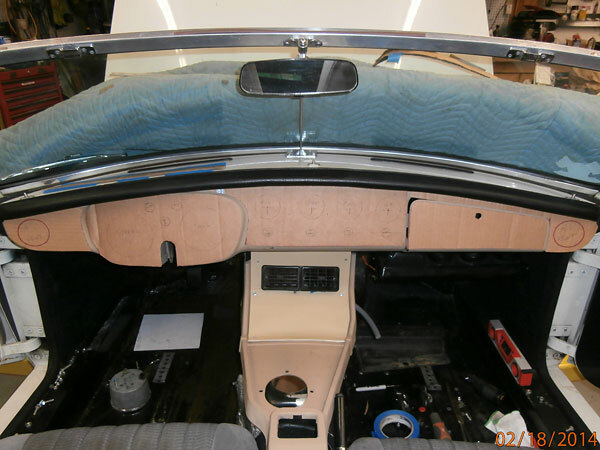 Custom dashboard and center console with air conditioning controls and vents. 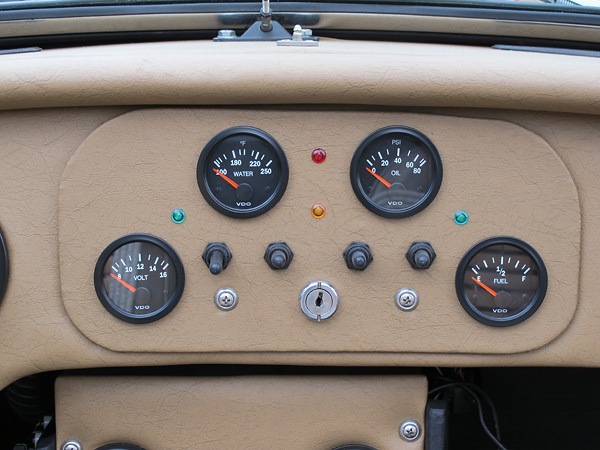 VDO voltage, water temperature, oil pressure, and fuel level gages. 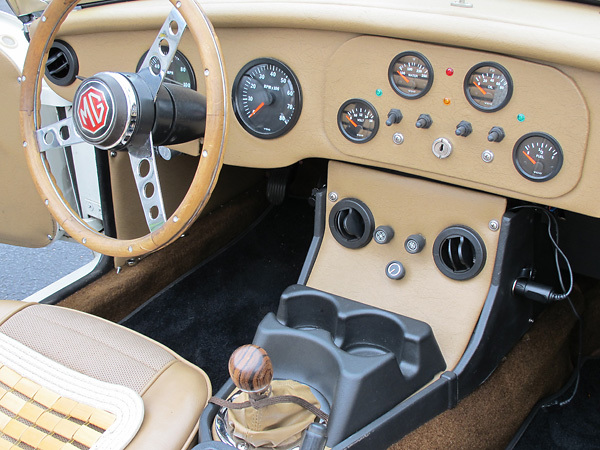 The day arrived, and the knob is what decided the color scheme of my interior." 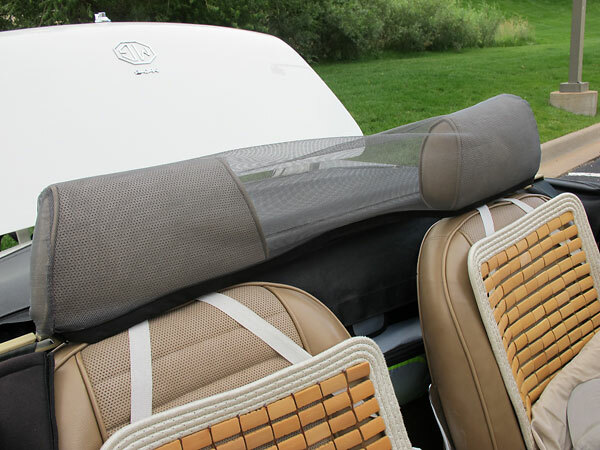 Sewn, removeable, mesh screen eliminates wind buffeting. folds down for easier access. It supports four more fused circuits than stock. 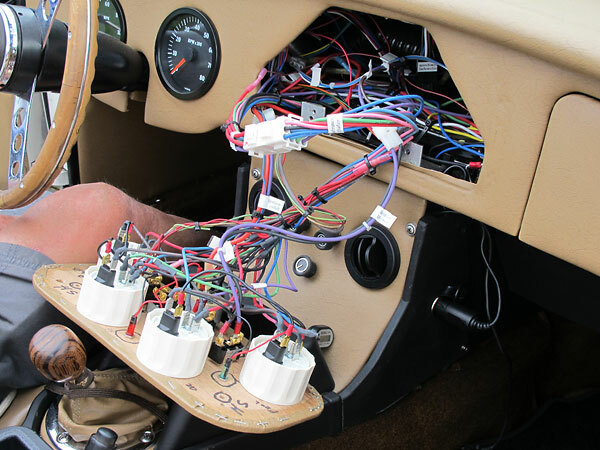 Dashboard construction and wiring conceived for ease of service. 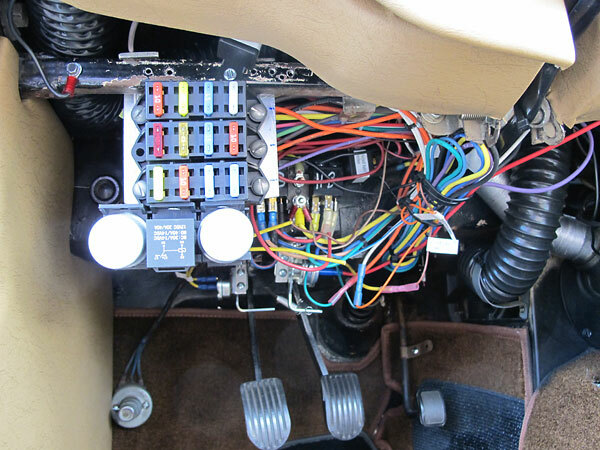 Cruise control "set" and "resume" and odometer "trip" reset pushbutton switches. 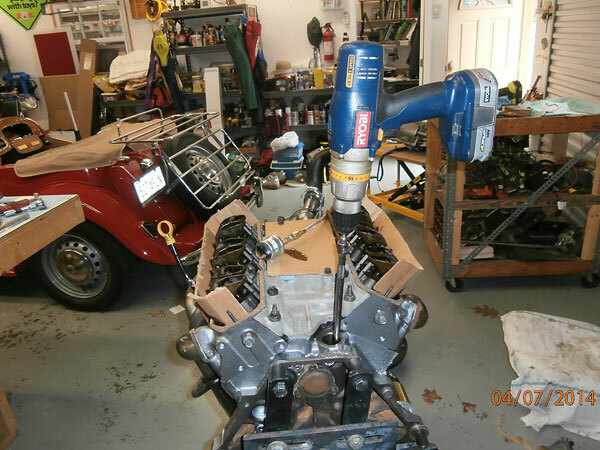 Making clearance for the driver-side cylinder head. 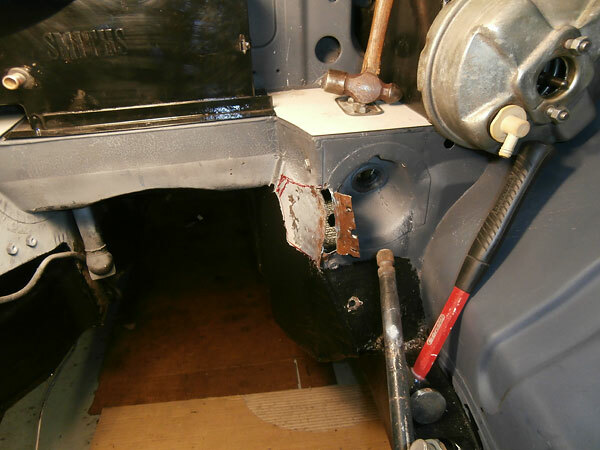 Late model MGB radiator in conflict with early model MGB steering rack. 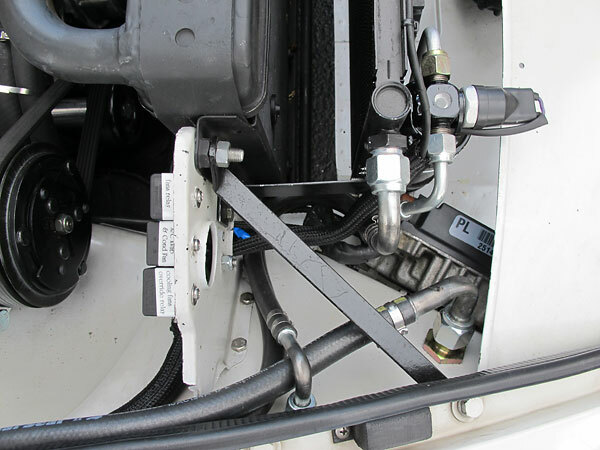 Short turn-up provides radiator hose clearance. 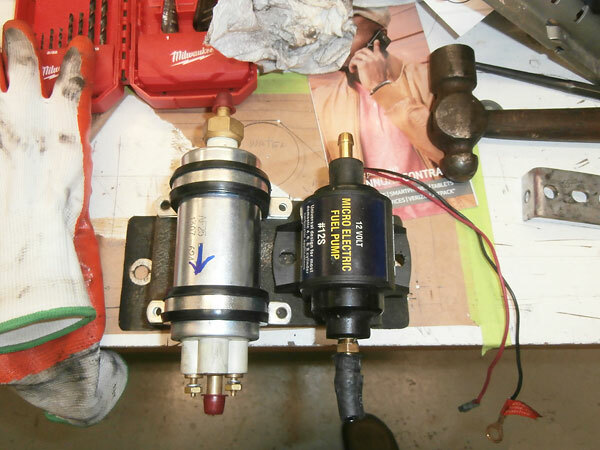 This brake master cylinder will fit, but only if its forward reservoir is mounted remotely. 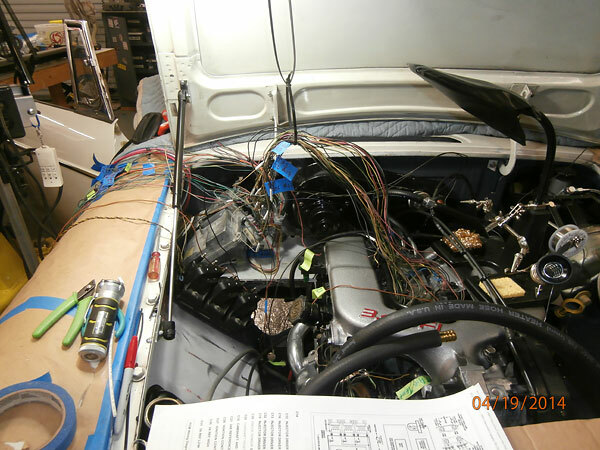 and applying shrink tubing to all of the engine control and sense wires." 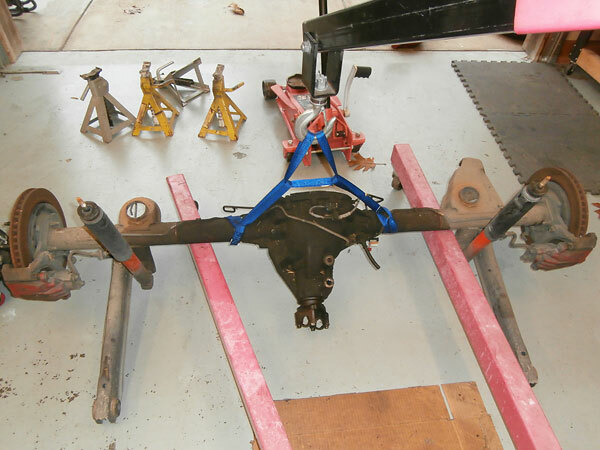 This transmission crossmember is part of the Classic Conversions Engineering kit. 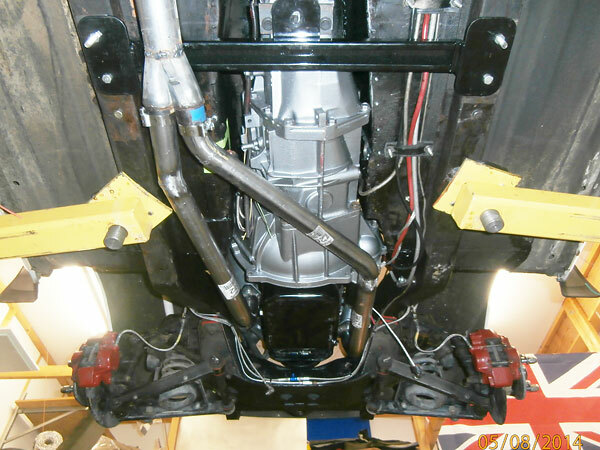 Chevrolet Camaro rear axle complete with disc brakes, ready to be narrowed. 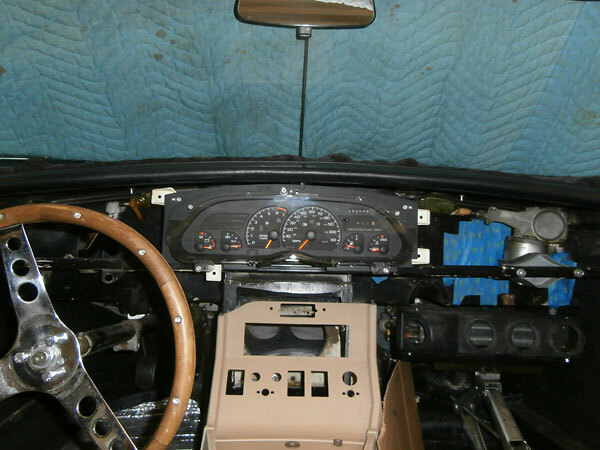 Trial installation of Chevrolet Camaro instrument cluster. Another dashboard mock-up. 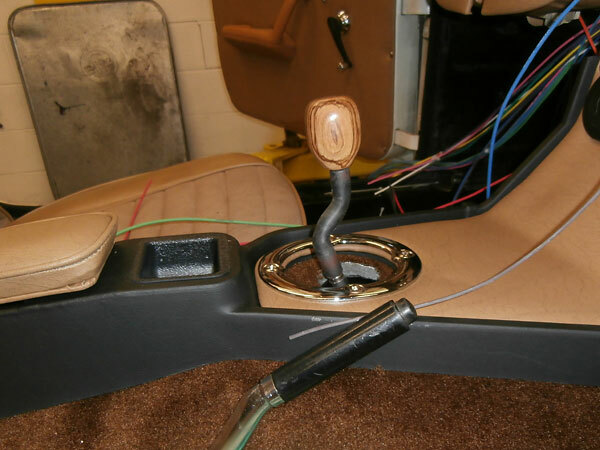 Note also trial installation of Pontiac Fiero seats. Evaporator from the now defunct ARA. Flexible hose from Nostalgic Air. Hard vent hose from Advance Auto. Shifter lever has been bent to get its angle just right. MGB fuel tank in foreground. Mazda Miata fuel tank in background. 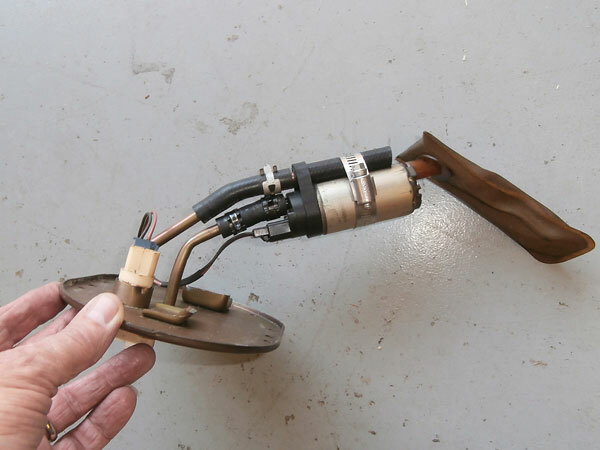 Mazda Miata in-tank fuel pump cut and bent to fit in a shallower tank. 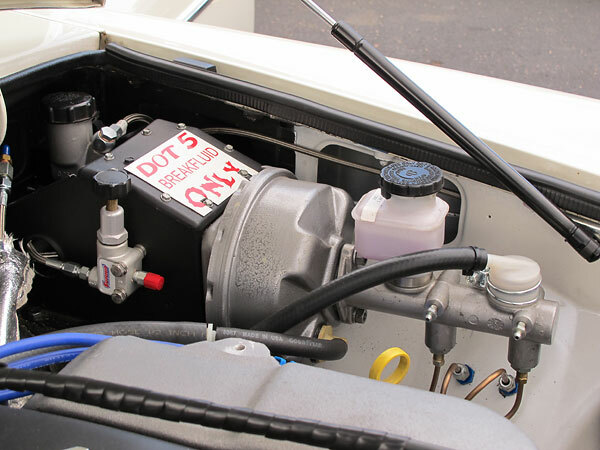 Modified MGB fuel tank with in-tank pump for electronic fuel injection. "Time constraints got to me, so I'm using these for now. They're quiet above 20mph." 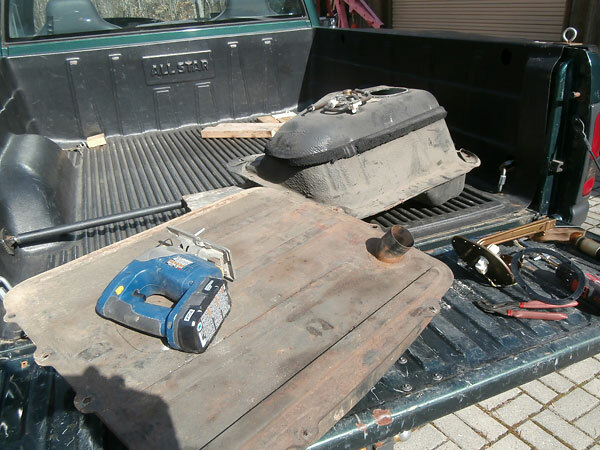 the starter to the passenger side, so Charles substituted a Chevrolet S10 bellhousing. 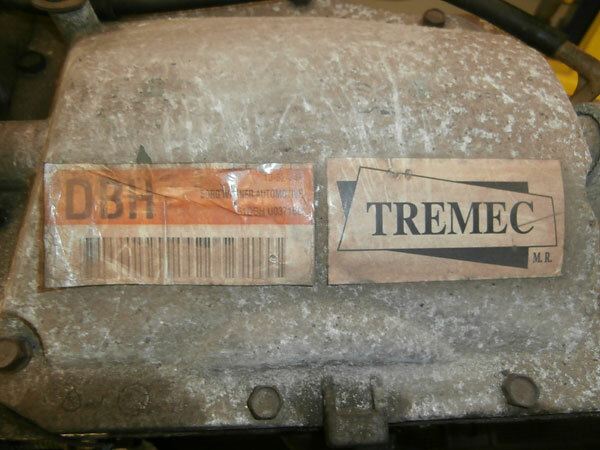 production rights to TREMEC. This particular transmission was built in the transition. 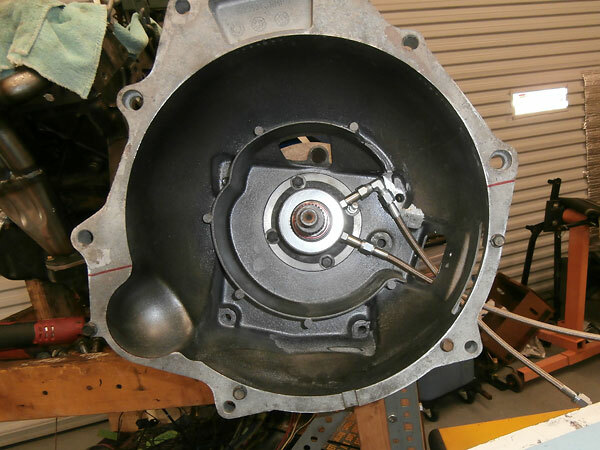 Test fitting the hydraulic throwout bearing, diaphragm pressure plate, etc. master cylinder. 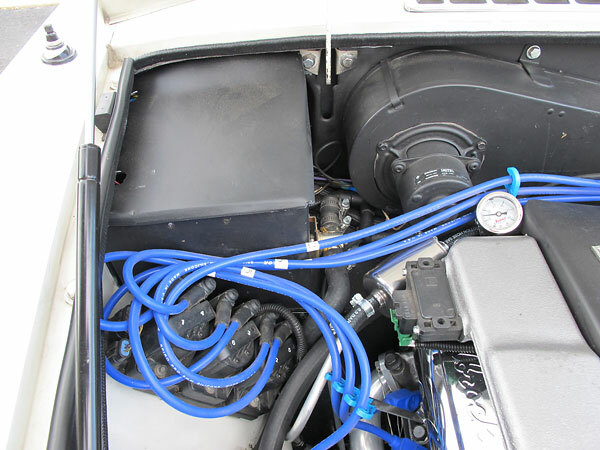 The second hose is required for bleeding the system after installation. 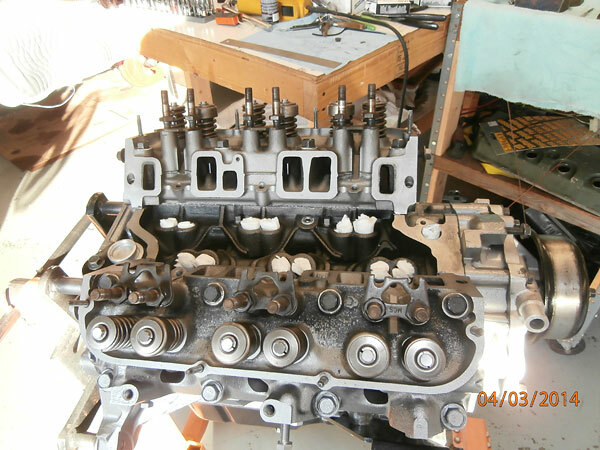 Installation of the cylinder heads. 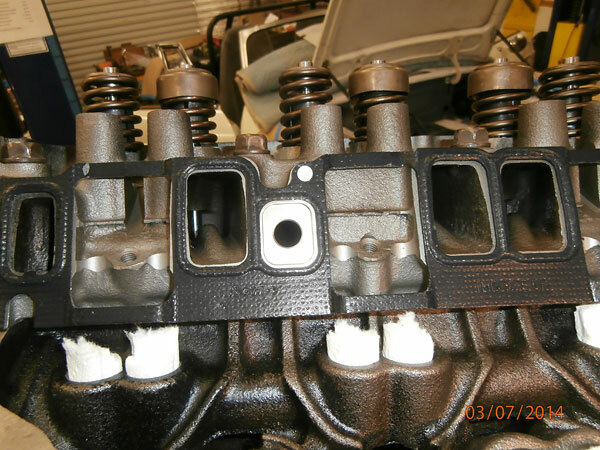 Induction ports of the Chevrolet 3.4L V6 cylinder head. "This water control valve wasn't required for my application." 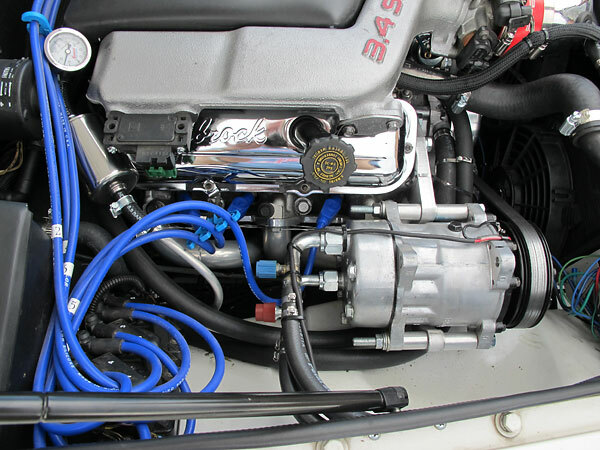 Installation of the intake manifold. dust storm in Illinois, and two hail storms (one in Townsend the one in Colorado)." "We got a good sand blasting in Death Valley on the way home from Reno. It may be time for fresh paint but I'll do that later." 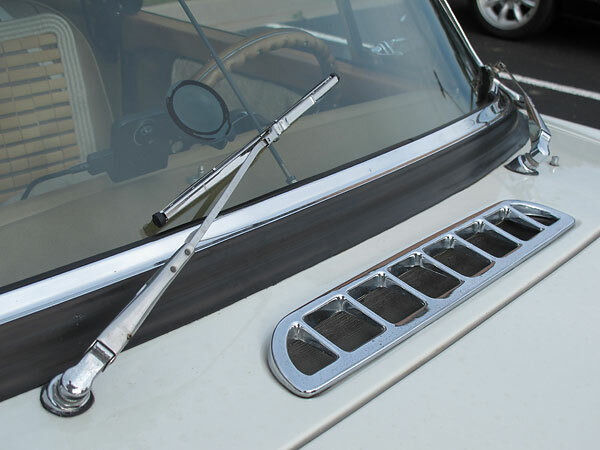 and to clear a larger percentage of the windscreen, later roadsters have three wipers. so placement and type have always varied widely. Yokohama Avid Touring S tires, size P185/70R14.